On 24 February 2011, Yayasan Petak Danum, (Water Land Foundation, an NGO in Central Kalimantan), wrote to the Australian Delegation that was currently visiting the Australian-funded Kalimantan Forests and Climate Partnership. The letter is attached (pdf file 380.7 KB) and posted in full below. Yayasan Petak Danum’s letter explains the concerns that local communities have with the KFCP and appeals to the delegation to ask the Australian Government to withhold funding for the project until these concerns are addressed. 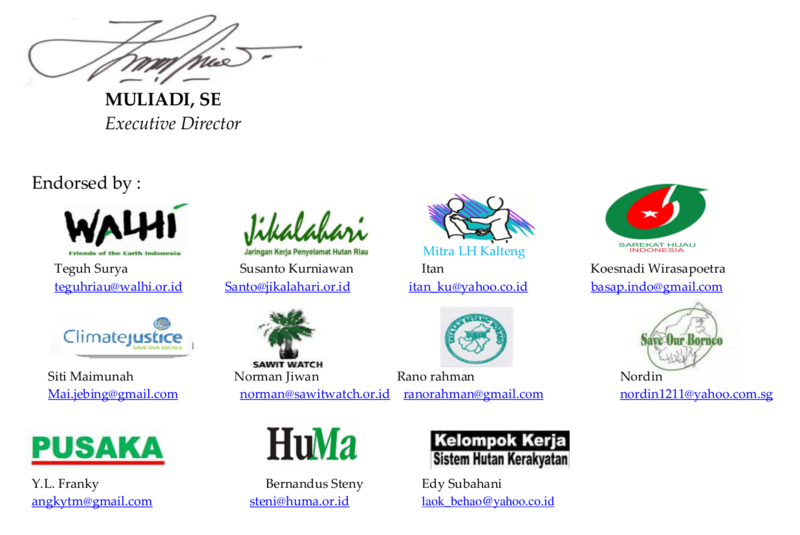 The letter is also signed by 11 Indonesian NGOs. to work with the Indonesian Government to rescind existing concessions in carbon rich forests and peatlands and impose an effective moratorium on future conversion concessions of natural forests whilst providing incentives to protect forests and to support low-carbon human and economic development initiatives. REDD-Monitor looks forward to posting the response from the Australian delegation. It is with great pleasure that we welcome you to our Dayak country. We appreciate your efforts in supporting forest protection and peatland restoration to reduce emission from deforestation and peatlands in Indonesia. 1. Bias reporting of the KFCP project progress – we understand that KFCP field staffs are paid on a performance-based basis and hence the incentive to engage in distorted positive reporting is high. We fear the effectiveness of the KFCP as a REDD+ pilot project will be compromised from the lack of accurate and reliable information to draw lessons from and to learn from, which should be the primary goal of a pilot project. 2. Lack of recognition and respect for customary (Indigenous) rights – our custom or adat has been in practice for a long time before the formation of the current regime and legal system. Its effectiveness and strength in ensuring the integrity and sustainability of the natural environment speaks for itself, judging from the healthy state of the environment and forest in Kalimantan until externally imposed commercial exploitation started to devastate, damage and encroach on customary/Indigenous land and forests. Since then, our people have been progressively disempowered and impoverished through decades of destructive projects either imposed directly by the Government or indirectly, with their blessing, through the uncontrolled and often illegally issuing of permits and/or concessions through bribery and corruption, all done without giving any due respect or recognition to our custom and rights. To date the Government of Indonesia has yet to formally honour the land tenure and rights of the Dayak people. Therefore the KFCP, by collaborating with the Indonesian Government, inevitably also condones this lack of consideration and hence the continued undermining of our customs and rights. 3. Lack of recognition of the customary Dayak wisdom – since the destruction of our peatland and forests from the failed mega-rice project (PLG), we have worked hard to restore areas closed to our villages and in our traditional farms. We have many good examples of fire prevention strategy through careful planting of crops which are resilient to forest fire. We also have other traditional ways of fire management and conservation which have a proven track record of effectiveness. We have offered our assistance to KFCP staff based on our traditional wisdom and knowledge but to no avail. Instead they prefer to pursue a strategy which we know will not work. 4. Missing the big picture of destruction – the KFCP project with a 120,000 hectares (half the size of Australian Capital Territory or ACT) project area pales in comparison with the 15.1 million hectares of the total area in central Kalimantan, at least 83% of which will be converted or destroyed through either oil palm, monoculture pulp plantations or mining permits issued by the relevant authorities. This amounts to 12.5 million hectares which is just under twice the size of Tasmania. Emissions from such a huge area will drastically overwhelm the insignificant and small reduction from the KFCP site, assuming that KFCP will eventually lead to emission reduction, which is an unrealistically optimistic assertion. 5. Absence of effective community consultation and engagement – to date, community consultation and engagement has focused primarily on facilitating project activities and getting the project off the ground. This does not represent a process or an attempt to seek free, prior informed consent. 5. Lack of inclusion of community input in the project and activity design – consultations and presentation as well as community meetings have been biased and focus only on getting the community to accept and participate in activities through monetary payment. All of the activities were externally designed and already planned with no room for community members to provide feedback or to give advice even when they have legitimate concerns and constructive input for the activities. Community participation and acceptance of the project are purely driven by the financial incentive involved, limiting the project’s sustainability and local ownership post project. 6. Lack of understanding of what REDD or Carbon is – Despite the supposedly extensive and comprehensive presentations and community meetings, most community members including many who have taken part in the project activities on a paid basis remained unclear about what REDD is and what carbon is and how their work or the project activities will contribute to emission reductions. As such their participation is far from constituting free, prior informed consent. 7. Lessons learnt not captured – Issues of concern raised by experienced concerned community leaders and individuals have so far not been taken seriously. Community Facilitators deliberately marginalise them as trouble makers who do not understand the project, rather than taking on board issues raised and considering their suggestions in the project or activity design. This does not constitute full and effective participation of communities as expounded by the Cancun Agreement on REDD+. 8. No confidence in the international NGOs contracted to implement the pilot project – The engagement of existing international NGOs with working experience in the area by the Australian Government assumed a positive working relation with local communities. In the case of Borneo Orang Utan Survival (BOS), the relationship has been strained and estranged due to BOS’ complete disrespect for the Dayak’s rights to the remaining forests which they have claimed as conservation area, without consultation with local communities for orang utan rahabilitation. Both of the organisations have not had a track record of success in their previous restoration and conservation work, beyond carving out Indigenous land and forests in the name of conservation which are out of bound for the Dayak. The community is not confident that the NGOs have the skills or the relevant experience to carry out environmental restoration or any other project activities in the area, beyond being paid personnel of the project. 9. No confidence in the Community Facilitator (CF) – The community sees the same Central Kalimantan Peatland Project (CKPP) personnel being engaged for the KFCP with a different project tag and hence are not convinced that KFCP will be any improvement from the previous CKPP. They did not see any benefit from the CKPP beyond the payments they received for taking part in externally-conceived project activities. CKPP has left a bad taste amongst the Dayaks as it has resulted in some of their forests being taken away and the restoration work not yielding any sustainable environmental outcome. Therefore the use of a few Dayaks in the CF team offers little comfort to allay the fear of the community that they will end up losing more land and forests through the KFCP project. Besides, in the eyes of the local community, the Dayaks employed are not from the same area nor of the same tribe and are therefore considered to have little interest in the overall welfare of the local Dayak Ngaju beyond his or her own personal self interests. We raised the above issues in good faith in light of the financial assistance from the people of Australia, and to minimise the risk of conflicts in the community and between the various stakeholders. We raise these issues based on our extensive experience gained in the field and from protracted discussions and meetings we have had over the last year. They were obtained directly from YPD field work, from the farmers and rattan makers network and our partners in the KFCP project area. To date, those involved in the KFCP project have not provided any assurance to allay our fear that our basic rights and our rights to natural resource management will be guaranteed for the 120,000 hectares within the KFCP project area. We are now using the motto “No rights, No KFCP” to represent the Dayak sentiment, which is consistent with the Cancun Agreement on REDD+ which recognizes those rights. Since 2003, Yayasan Petak Danum has been supporting communities in 12 villages in the sub-district of Mantangai through our Community-based Peatland Use Program in accordance with our traditional wisdom. The Plan is designed to reduce poverty and to restore the peatland. We have collected a lot of information from our program and we have a lot of experience in peatland management in response to the destructive mega-rice project. As senior Government representatives from an advanced democratic country that respects and upholds human rights and justice; a Government that has so courageously and yet humbly made the historical public apology to the Aboriginal people for the wrongs done to them, we appeal to your delegation to urge the Australian Government to withhold funding from the KFCP project until the issues raised in this letter are resolved. The most effective way to reduce emissions from deforestation and forest degradation in Indonesia is for Australia, and other bilateral and multilateral donors as well as parties interested in REDD+ projects, to work with the Indonesian Government to rescind existing concessions in carbon rich forests and peatlands and impose an effective moratorium on future conversion concessions of natural forests whilst providing incentives to protect forests and to support low-carbon human and economic development initiatives. c. The complete loss of the Dayak Ngaju traditional knowledge in the management of rivers (known as Handil and Tatas), streams and creeks in every aspects – from the conceptual, practical to the customary institution. Most of us watched with anguish the wholesale destruction of our land, our forests and our waterways in the duration of the failed mega-rice project (PLG) because we could not fight the violence and brutality of the military under Suharto. A courageous few were beaten up and went to jail for daring to challenge the Suharto Government. Since then our land and forests have been diminishing – destroyed from exploitative commercial activities as well as seized from us in the name of conservation. We were confused by the claims of both the exploiters and the conservationists. We have now learnt our lessons and we will no longer be standing by watching our Indigenous rights eroding away and our natural resources taken away from us. Thank you for your attention and we look forward to your co-operation and response. I am still positive thinking on this project, if the management of the project is good. I applaud the courage of Petak Danum in raising these issues. As a former Australian Labor member of (state) parliament,and then Chief Technical Advisor (Team Leader) of the UNDP/GEF Agenda-21 project which was designed to implement sustainable development into the national planning/Repelita process, I am embarrassed to say that at least one of my advisors in that project had worked on the mega-rice project, and that we all failed abysmally in our mission to inculcate anything approaching ecological sustainability into national planning. The GEF/UNDP and I may have messed it up last time, but if any of Indonesia’s forests, wildlife and adat communities are to remain viable beyond the next ten years or so, REDD+ needs to be done properly or it will go the way of Agenda-21. This is an example of how difficult to implement REDD+ on the field. Meine’s strong findings in his paper shows that many interest parties on REDD+ pulling each other using weak institutional frameworks in Indonesia, perhaps, including this letter too. I am sure that not all 9 points mentioned in the letter are true; However, this letter proved that KFCP should distribute information clearly and regularly on their findings, what works and don’t work on REDD+ to the outside world. Perhaps, this could become a communication bridge to all parties. Good project management is a key point to success as raised by Fajar, and I share your point on that. The only way for KFCP to response the letter is to share all its approaches, data dan information openly to all stakeholders at all levels, what have been done on the ground including strategy to involve local community in the region. I do believe too that points made in the letter are probably not all true and based on valid information, but, agreed to Robertson’s point that the KFCP project needs to take this as a lesson learnt to develop better approaches and strategies on the interest of all REDD+ stakeholders. @Medrilzam (#4) and @Alue Dohong (#5) – Thanks for your comments. I’m intrigued by your comments that not all points made in the letter are true. I wonder which points you consider not to be true and what evidence you have for believing them not to be true? @respond to Chris Lang(#6): I have been doing my research,staying there, and engaging with Dayak Ngaju community in this area, therefore, we can have long discussions to debate on all those 9 points. However, to not complicate things and for the sake of good progress of REDD+ implementation, for the time being, just leave it to KFCP management or IAFCP management to respond. I also want to hear their comments and reactions to this letter. I do believe they monitor this redd-monitor intensively. @Medrilzam (#7) – Thanks for this. I’ll post a response to the Yayasan Petak Danum letter as soon I have a copy. Once the letter is available, I would still be interested to hear from you which points in the letter you think are not true, and why. In the meantime, though I’m happy to wait for the official response. @Response to Chris Lang (*6): Same as Medrilzam that I don’t want to discuss further deep into on issues raised in the YPD’s letter as I think KFCP management is in the best position to response those. As your information, I have been worked in the area mentioned for over than five years and I am Dayak Ngaju as well as there are still few of my relatives stay within the existing villages. I think, can be very naive and misleading if we concluded that all Dayaks in the area are singing same tone with the letter. I sometimes sad to learn that people who just made a very short visit and interact with very limited Dayak people in the area, but later on came up with conclusions as if they are acquaintance to and have the right in representing the interests and aspirations of the whole Dayaks there. I often thought that the Dayaks often not only become a victim but their aspirations and thoughts are being hijacked and diverted for the self-interest of a program or organization purpose. I think it will be worthwhile to develop spirit of partnership and positive thinking among the stakeholders/players rather than tries to yawning the gaps between them. Mr Alue, I really salute with your answers, instead did you ever work in KFCP and why your advice is do not you do when you work in KFCP…????? I saw a formal latest presentation of Mr. Heru Prasetyo (Secretary of REDD + Indonesia) about REDD + Central Kalimantan in Palanga Raya, and I recognized that he has taken a wrong “logo” of Central Kalimantan Provincial Government’s logo, that he was talking about.